Emily: In spring and summer, all I want to be wearing are effortless dresses that still feel really stylized. This dress fits the bill perfectly: The color adds a fun pop, the cut is universally flattering, and the subtle checked print adds a nice graphic element. Lisa: Not only is this piece very well-made and flattering on, but it covers two trends for 2019: button detailing and check/plaid prints. But The East Order designed the Mahalia dress in a way that stands out from the others. The asymmetrical buttons and micro check make this a really special piece. Emily: It&apos;s no surprise that I live for a sweatshirt, particularly ones that have a slight vintage vibe. This one is both oversized and cropped, which means that it&apos;s comfortable and cute and would look great worn with a pair of broken-in denim shorts. Lisa: I will always be the girl whose closet has more black in it than any other color, but navy may be my second favorite. I love this vintage blue that leans into the vintage graphic. Since, as Emily mentioned, this is oversized and slightly cropped, it&apos;s ideal for your new high waisted Jamie High Rise jean. Emily: These earrings are like a little party for your ears. I love that they strike the balance of making a statement while also being dainty and simple. While these would look great paired with an off-the-shoulder dress for an event (this one&apos;s on sale! ), they&apos;d look even cooler when worn with a white tee and jeans. Lisa: Another trend we saw a lot of last year, and spilling over into this year, is rainbow jewelry. 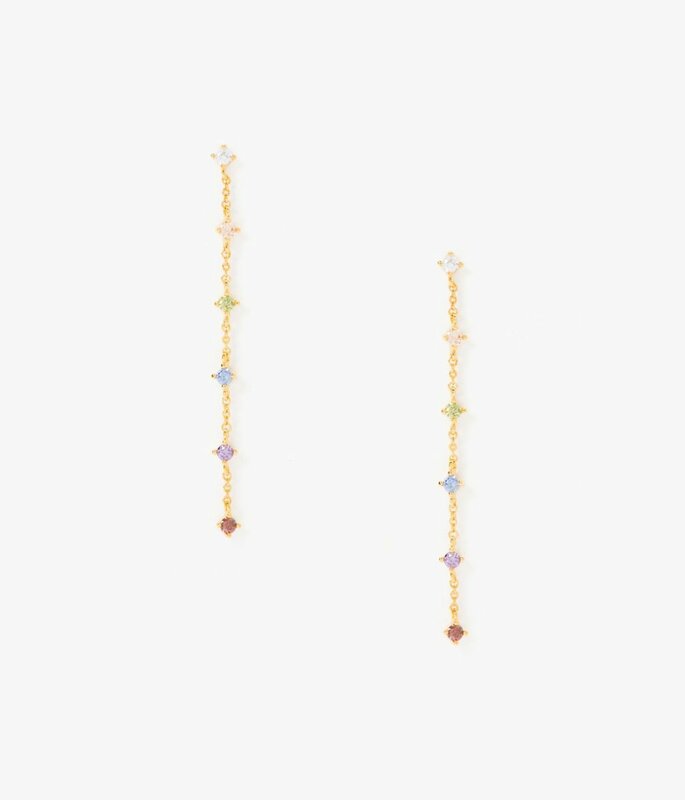 The pale stones are a great update to the rainbow stone trend, and an option for your high-low days! Emily: Plaid has quickly surpassed stripes for the print that takes up the most real estate in my closet. This dress has a professional feel without being stuffy, making it ideal for work lunches, but it&apos;s the little details that make it stand out: the fold-over detail in the front, the pops of neon, and the nipped in waist that ensures it will look good on everyone. Lisa: You might think having more than a couple plaid dresses is too many, but the ones we have in the Shop are different for a reason. They each serve a different purpose in your wardrobe. While the Mahalia is more playful and sweet, the Yuri dress is cool and functional. An excellent transition from work to happy hour, this piece is easy to wear while being on trend. The waist detailing is part of the structure of the dress, so no losing the belt or having to tie the front. Emily: If you&apos;re not a bath person, these lavender bath bonbons will be enough to convert you. 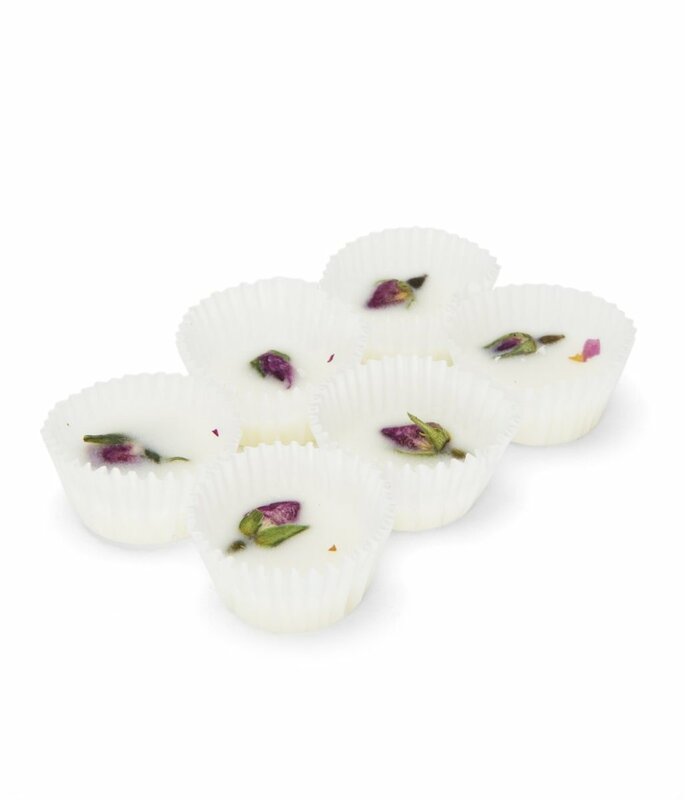 They look like adorable little confections but help transform a plain bath into one that feels luxuriously indulgent. I keep mine out since they&apos;re so pretty and when paired with a face mask and glass of wine, help make the entire evening (bonus: they make an incredible gift as well). Lisa: These! We were really excited for these to arrive in the shop because they are unlike any bath products we have ever seen. Beautiful at bath-side, these bon bons are just the addition you need for your self-care. After dropping them in your tub, they will smell amazing (they come in Lavender or Clementine!) and leave your skin feeling really silky. We are looking forward to more from this independent beauty company. 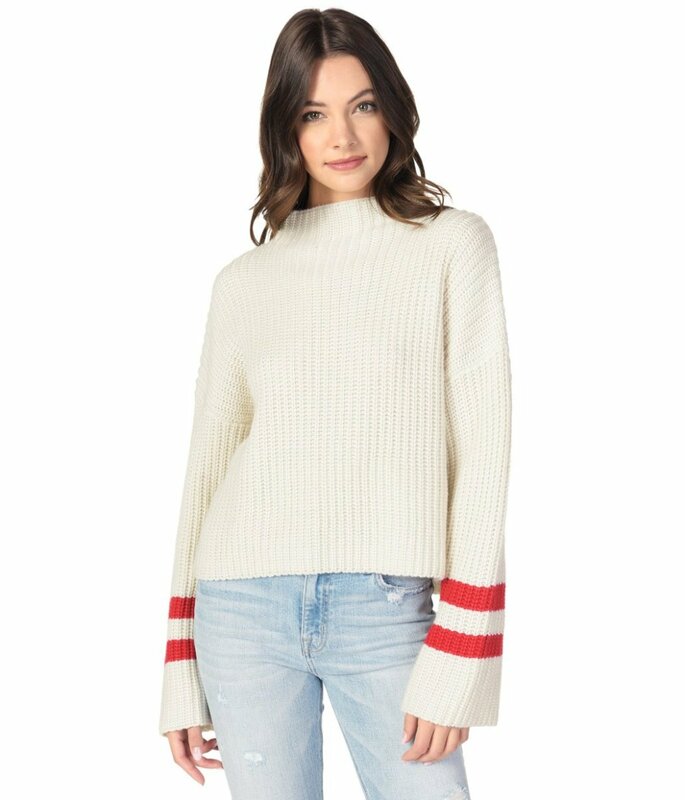 Emily: Graphic stripes are a trend that isn&apos;t going anywhere and when added to the sleeves of an otherwise classic sweater, they turn it into a wearable statement piece. This has the feeling of a sweater you&apos;ve lived in for years, but with details that make it feel incredibly current. Lisa: Pre-Spring is the time we transition out of more serious styles and start getting ready for the sun. Hello, Mulberry sweater! While it&apos;s still really cold in most parts of the country, you can wear this under your coat as your essential layering piece. 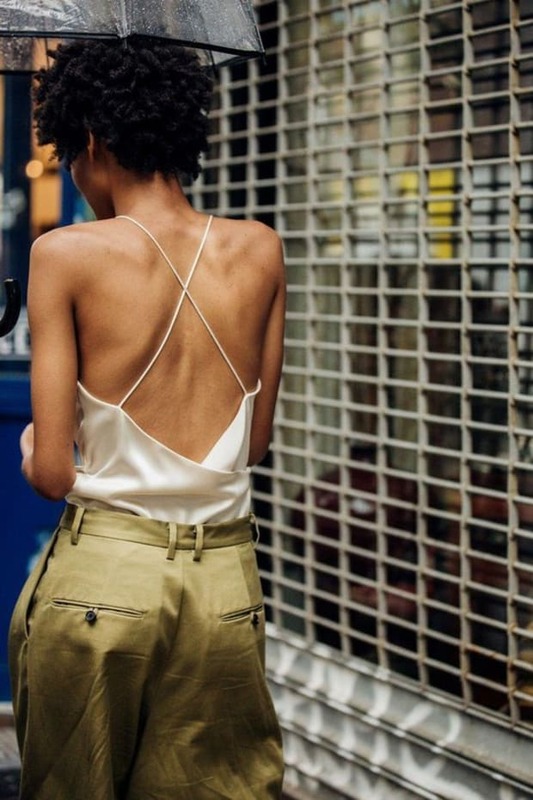 In warmer places, pair with your high waisted jeans and some ankle booties. The thicker knit is super soft, and the play on the varsity trend is a simple way to add style to your cozy sweater collection. Emily: Structured bags with the option of a top handle or cross-body versatility are all I want to reach for. This one can go from day to night and I&apos;d tie on a little vintage scarf to add a bit of flair. Lisa: I want a nice, big, beautiful handbag, but I always revert to a cross-body or something that I don&apos;t have to remember to grab (I WILL forget a large purse at a restaurant if given the chance!). The Tory Top Handle Bag is the perfect combination of statement and functionality. 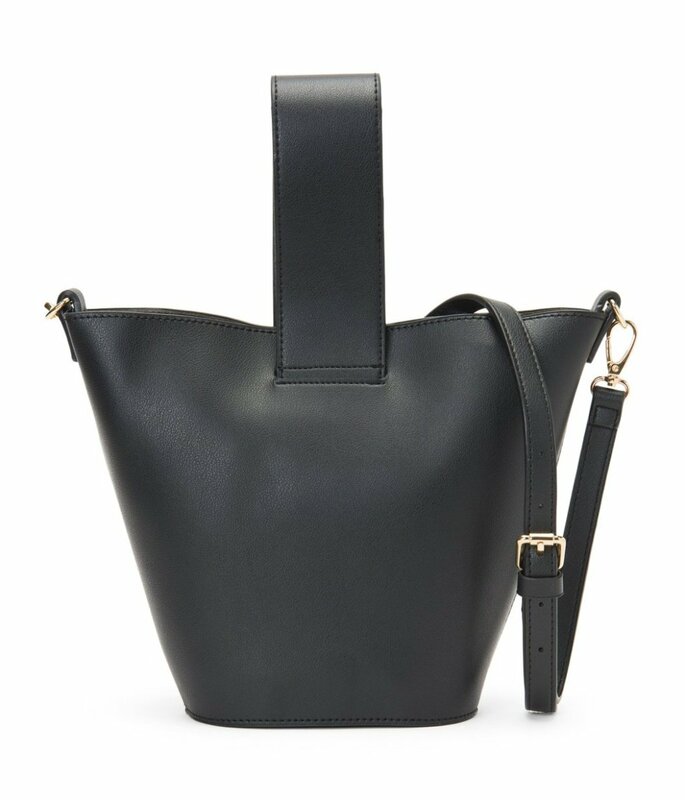 The top handle is my favorite feature, but it also comes with a cross-body removable strap that is convenient and easy. 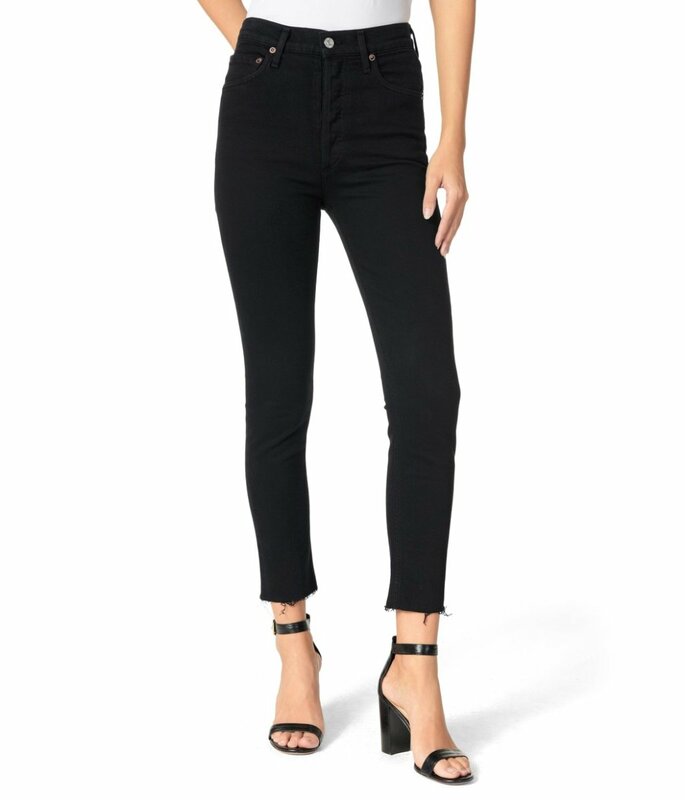 Emily: I&apos;m very happy that high-rise jeans are still very much a thing - which, I suppose makes sense, since they make everyone&apos;s legs look so much longer. AGOLDE&apos;s my denim line of choice since they hug in all the right places, are incredibly comfortable and offer a vintage look without the hassle of digging through racks at a flea market. The frayed hemline makes these the ideal for showing off your shoes, whether it&apos;s a strappy stiletto or pointy-toe flat. Lisa: We know and love the Jamie High Rise, but the Nico is a new favorite from AGOLDE. Slim but not too skinny, these button-fly jeans are the right balance of vintage-inspired and practical. The raw hem gives a slight edge to the style, which can be dressed up with strappy heels and the Barrington Blazer. These are my new favorite jeans! 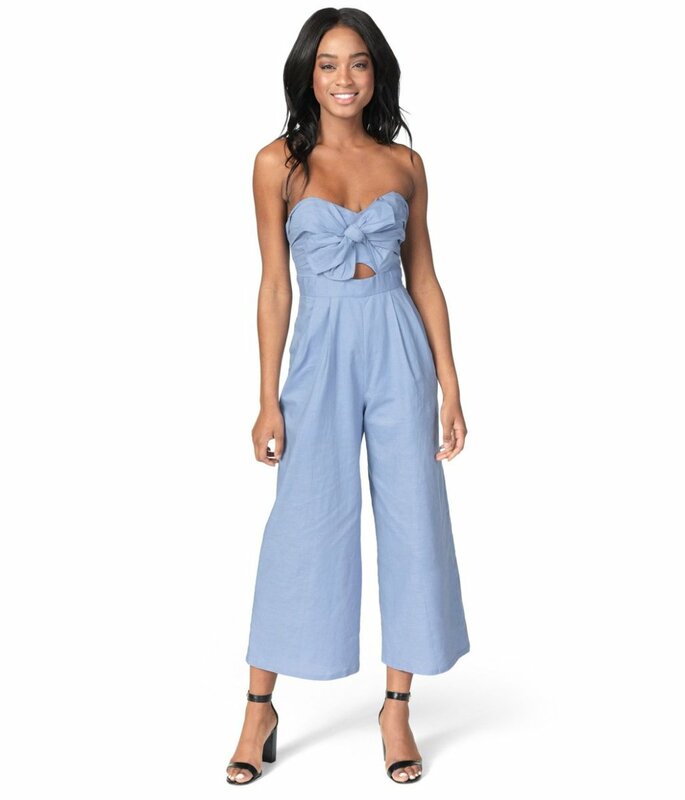 Emily: We had a similar jumpsuit last season that sold out immediately, so we wanted to bring it back, but in a different color. Shades of periwinkle and lavender are the colors that everyone will be wearing this spring and summer and this piece, with its peek-a-boo opening and flirty bow makes it the ideal piece to wear to barbecues/engagement parties/concerts/date nights... you get the picture. Lisa: cupcakes and cashmere readers might recognize this ASTR style from last Spring when we carried it in a pale cream colorway. We loved this piece so much that we brought it back in two colors this year (lavender and rose)! The update in &apos;rose&apos; is flattering on all skin tones and can be dressed up for a spring wedding, engagement photos, or date night. Paired with high top white Converse and a straw cross-body bag, the lavender option is ideal for rooftop brunches or a stroll on the boardwalk. Emily: A super-soft knit in the cutest colors? Sign me up. 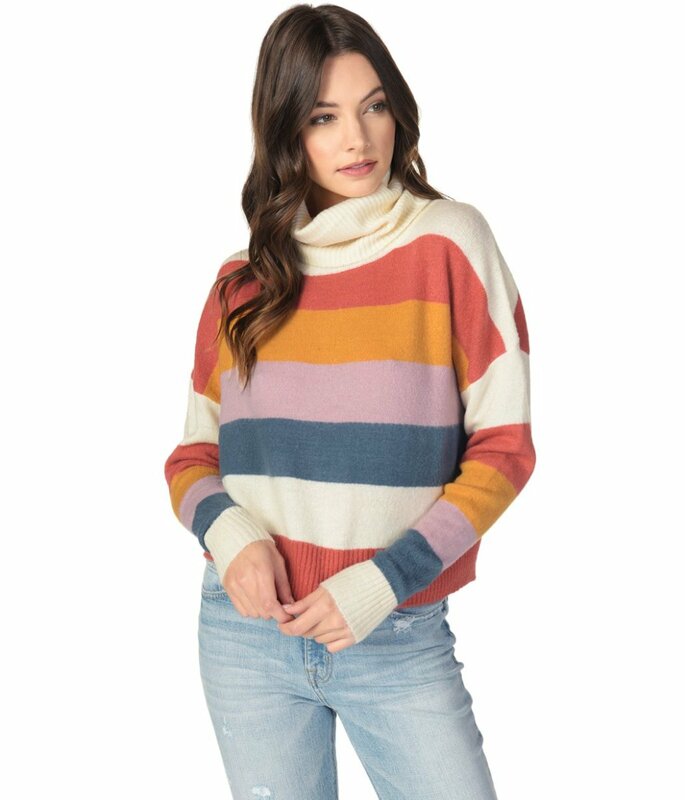 This sweater would look great half-tucked into a pair of high-waisted pants, a pair of hoop earrings, and a platform heel. Lisa: Trust me, this is one of the softest sweaters we have in the shop right now. It&apos;s still very cold in most of the country, and although we are all ready for Spring, we still need something for the in-between. We all agree that stripes can be personal, and this color combination is really smart and cool. Very slightly cropped, this sweater paired with Emily&apos;s favorite Jamie High Rise denim is a sweet transitional combo. 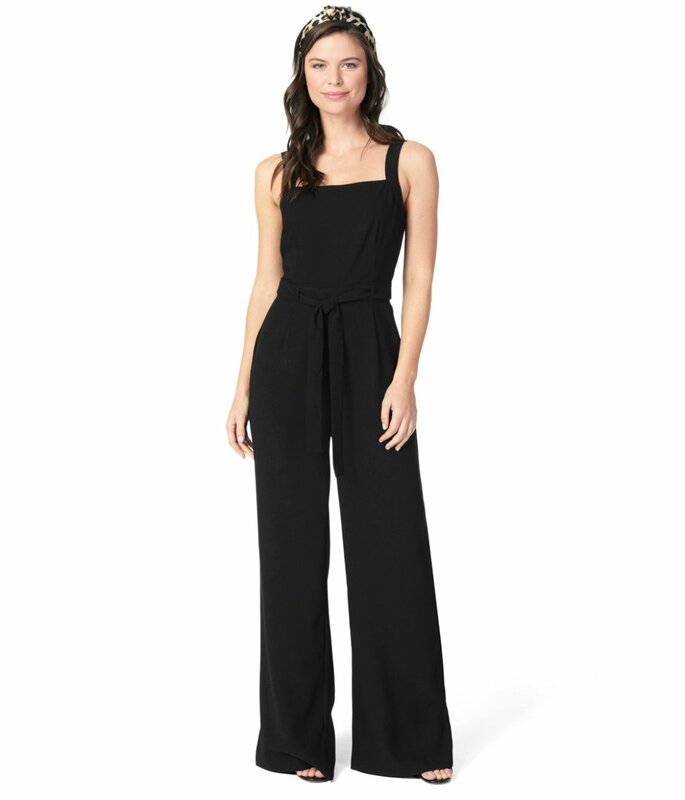 Emily: Anytime I need to get dressed up, but don&apos;t want to feel too predictable in a dress, I reach for a jumpsuit. This one&apos;s great since the tie waist allows you to cinch it in and would look just as good with a bright bralette as it would layered over a thin white turtleneck. Lisa: I wore this piece to a company event, and I fell in love! I styled this with a black tuxedo blazer for a more elevated, professional look, which still looked stylish and special. But it can also go casual, paired with a baby tee (like this fave!) underneath. I recommend wearing a bit of heel with this, as the wide leg feature is meant to run wide and long, also a trend I&apos;m loving this year.